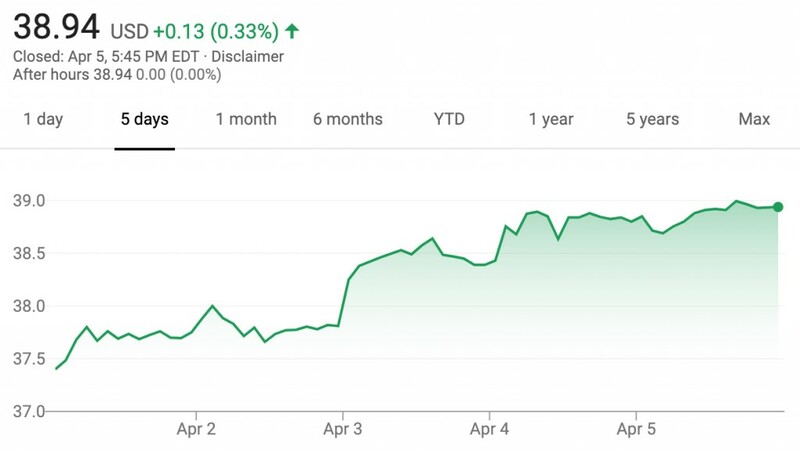 The value of GM stock increased during the April 1st, 2019 – April 5th, 2019 timeframe, closing the week at $38.94 per share. The performance represents an increase of $1.81 per share, or 4.87 percent, compared to last week’s closing value of $37.1. The change represents the second consecutive week of growth for GM stock value following a two-week slump. Shares saw a weekly low of $36.92 (on Monday) and a weekly high of $39.01 per share (on Friday). By comparison, shares of GM’s cross-town rival, the Ford Motor Company, gained 5.4 percent during the week. So far, 2019 has been a net positive for GM shareholders, as there was a seven-week-long rally prior to the two-week drop. Over the last few years, GM has taken many steps to increase the value of its stock, including exiting markets where it is unwilling to or can’t find ways to turn a profit (such as Europe, South Africa and India), closing plants in various parts of the world, divesting loss-making divisions (such as Opel-Vauxhall), making adjustments to its business model in order to prioritize profitability over chasing market share goals, focusing on its Cadillac luxury brand for high profitability, investing heavily into new-age mobility ventures such as electric vehicles and autonomous driving tech, and discontinuing some sedans (Cruze, Impala, LaCrosse, XTS) to focus on more profitable crossovers, SUVs, and pickup trucks. Despite these notable actions, the value of GM stock has historically hovered around the $33 per share mark, roughly the IPO price of the “new GM” in November 2010 – a circumstance that has had many investors frustrated. However, the current value of $38.94 marks a notable improvement in the value of GM shares. Subscribe to GM Authority for ongoing GM stock news and complete GM news coverage. GM made $147B in revenue last year, and Toyota made $265B in the same time period. How come Barra was paid over $20 million and the president of Toyota under $3 million? As a reminder, we bailed out GM, not Toyota, and Toyota is the one investing $1.6B in a new plant in Alabama. It’s cute that Toyota is investing that in a new plant. Make no mistake about it: GM makes way more product and employs significantly more people in the US than Toyota does, new plant or not. Toyota’s investment brings it to 40% of what GM makes Stateside. And Toyota plants run without the union… unlike GM plants. Don’t throw the baby out with the bath water. Or rather, go ahead and try to understand how much the union screwed GM to cause a scenario where GM needed a bailout. Also, not sure the Honda chief makes that little. Might want to check out deferred/vested stock bonuses to get a better idea of his total compensation plan. Of course when in doubt blame the union. Not the piss poor management GM had starting with Roger Smith. Unions do not design poor product or cheapen things up to appease analysts. Regarding employment, GM has been shrinking it since the mid 1980s far more than any automaker. In 1985, GM had more assembly plants in the state of Michigan than they had nationwide now. I would never buy a Toyota but I would not be surprised if they paid just as much if not more than GM. Face it. GM is being run today by an incompetent, myopic, out of touch CEO much like the CEOs she worked under during her career. The union has plenty to do with the struggle of the domestic auto manufacturers. Compare the wages and benefits that Toyota pays its US worker to those of a UAW worker doing the same job. There’s a reason why companies like Toyota, Honda, Nissan, and VW stick to southern right-to-work states when they build a plant in the US. Yes, please check out that Honda pay and deferred stock options…Oh, wait, what’s that? Greedy Mary Machete Barra still makes more than anyone in the industry yet GM is the worst performer? Wonder how the 20,000 average Americans and Canadians fired by Mary Barra are doing these days? Did she take a pay cut? Will she fire herself for poor performance? What happened to “grossly overpaid execs”? What happened to “greedy CEOs”? What happened to “those evil businessMEN for accepting ridiculous pay while the American worker suffers”? Oh, I guess that only applies to other people not your friends, muses or political buddies. While we bailed out GM and Chrysler, Toyota and other Japanese companies have been given zero interest loans and subsidies from the Japanese government for decades that allowed them to perfect their product for overseas markets. GM and Chrysler got absolutely nothing from the US government that Honda, Nissan, Toyota, etc got from their government all the while the US government was paying for most of their defence. Whatever happened to FCA moving Ram production out of Mexico and back to the US? Except FCA is investing $4.5 billion in Michigan/ U.S.A.
GM, on the other hand, is closing plants, firing 20,000 plus workers and counting, destroying communities and the tax base for social programs in the process. Meanwhile all Miss Mary Barra can muster is another photo shoot and publicity stunt with dumb media types. Pretty bold claim considering Ram sales aren’t exactly looking that great. Up in March 2019 vs March 2018 only because Ram sales were way down in early 2018. Compare Ram sales in March 2019 to sales in March 2017 and they’re flat despite having a totally new truck with an interior 10 times nicer than the Rams they were selling in 2017. It’s also funny that so many people here are spelling Doom for GM’s halftons and attributing it to Ram. The situation with their 2019 Silverado/Sierra is identical to the situation that the 2014 Silverado/Sierra faced at this point in their life cycle. Just like the 2019’s are being criticized for their styling and bland interior, those same reviewers criticized the blocky styling and bland interior of the 2014’s. The sales of those trucks in first 3 months of 2014 were LOWER than the sales of these trucks in the first 3 months of 2019. Once incentives matched the competition sales took off in 2014. The incentives on the 2019 GM twins isn’t close to matching the huge incentives Ford and Ram are offering. Once they do the whole situation could change. There’s a big difference between the two. THE UAW. Toyota also rehashes the same platform for decades, deficiencies and all. The Tundra is well over a decade old and the gas guzzling 5.7 that powers it dates back to the early 2000’s. Even the interior is filled with extremely dated parts. The 2016 Tacoma is a lightly rehashed 2nd gen Tacoma. So rehashed they carried over several known issues to the 3rd gen Tacoma including the windshield whistle, vibrating front diff, rear DRUM BRAKES, squeaky clutch pedal assembly, and a mediocre clutch known for its poor longevity. They’ve also outsourced a lot of major components that used to be made in the US. Most notable is the Tacoma’s rear axle, which was made in the US but was outsourced to Thailand for the 3rd gen. Speaking of outsourcing, the majority of Tacomas are now made in Mexico. Toyota just spends hundreds of millions upgrading the Tacoma plant in Baja de California, MX (near Tijuana) to increase production capacity. Toyota is also spending well over a billion dollars to build a new truck and suv plant in Guanajuato, MX. One of the trucks it will be building is the Tacoma. Once it’s online this fall, any Tacoma production still being done at Toyota’s San Antonio plant will shift to Mexico. Since Toyota is a media darling, nobody criticizes them for sending Tacoma production to Mexico while reducing production of the Tacoma in the US. Or moving their axle production from the US to Thailand. Sourcing more engines from overseas instead of making them in the US. Or repeatedly threatening their US auto workers at the Camry plant, telling them their jobs are at risk and could be sent overseas at any time. They’re so stingy these days that they keep tight inventory control of the PENCILS. You shower Toyota with praise for spending $1.6B in a plant in Alabama, yet you completely ignore the fact that GM has spent billions in investments in the US plants in the last couple of years. They spent over $1B in an axle plant in Michigan. $1.4 billion in their Arlington plant. $1.2 Billion in their Fort Wayne Indiana plant. $1.8B in their Flint truck plant. $300 million in their Orion plant. $670 million invested in their Toledo transmission plant. $211 million in their Lansing River plant. $118M in their Bay City Powertrain facility. $37 million in their Bedford Casting plant. A total of over 800M in their Spring Hill engine plant. Hundreds of millions at their Bowling Green plant. Wow GM has made a ton of investments in the US. Some of those plants are manufacturing the most expensive parts of a vehicle — the engine and transmission. I would imagine that manufacturing those two components creates as much economic activity as a plant that just assembles a bunch of components in a final product. Engines and transmissions require a ton of tooling, skilled employees, and intensive QC. You are right that powertrains require a lot of labor and skilled trades, but nowhere near that of an assembly plant. The powertrain plants may have spinoff jobs such as companies that cast, forge, and machine the components for the powertrains, but assembly plants have exponentially more. Assembly plants are far more complex. Unless the body is pre-assembled and painted (like the Dodge Viper), the vehicle has to be welded together, painted, assembled, tested and prepped. An assembly plant today costs nearly twice as much as a powertrain plant. In comparison to the investments Ford, FCA and even Toyota has made in the US as of late, today’s GM is miles behind. Yep power trains are so complex that they let the public in and pay to build their own engines. Engine production is just as a line and set up as a process that is not difficult or even high skill. Even the tooling tightens and torques the bolts for the head and bottom end all at one time to the proper torque and sequence. It is not like building an engine at home. It is so simple at the plat a Tigger could do it. That’s more than we can say about you…. An assembly plant costs that much because it’s a bunch of robots putting panels together. They have Joe Schmoe standing at the E-stop, maybe feeding it panels at most. They also moved 3.5 Ecoboost production from the US to Mexico. You mean to say there’s no robots in engine and transmission plants???? Please prove your “I would imagine that manufacturing those two components creates as much economic activity as a plant”…Stats, numbers, FACTS!?!?! No, it doesn’t! It shows GM is regressing into a lower-tier parts/ systems module supplier, not a full-line automaker it is supposed to be. It is doing what third world countries now can do and any economic gain is completely lost in the many plants they closed and 20,000 + workers they fired. Let me guess, “educated” in a Detroit-area public school? Let me guess, you’re another jobless union lackey upset that you’ve been left behind. Indeed this website seems to be filled with disgruntled Unifor and UAW people trying to blame Mexico for their misfortunes. Quick portray GM as evil while turning a blind eye to the fact that Ford, Toyota, Honda, and others are all moving to Mexico or overseas just as quickly as GM. They just keep regurgitating the same garbage “GM bad, everyone else good”. I am not a member of the union, but I feel that laying off people while making record profits is pure greed and is plain wrong. I am sure the 15,000 non-union salaried folks that Machete Mary canned would feel the same way. They’re doing what they should have done 15 years ago. Meanwhile Ford and FCA are marching right off a cliff just like they did during the last recession. They’re dumping fuel efficient cars and going all-in on gas guzzlers and huge SUV’s. They don’t have a plan if fuel prices spike again, which will happen again at some point. FCA is the absolute worst. What’s their business plan right now? Hand out $100 million a year to the feds for failing to meet CAFE requirements while selling Ram 1500’s that are less efficient than the previous gen truck, Jeep Wranglers, and anything that they can wedge a Hellcat into. Not exactly the lineup to have when gas jumps to $5/gal. LOL Tesla is making a stealing off of helping FCA out with their gas-guzzling strategy. FCA isn’t just being fined under CAFE. The EU is also fining them for missing emissions limits. “Although FCA announced a bold $10.5 billion plan to electrifiy its lineup by 2022, its actual plug-in portfolio is currently limited to the Chrysler Pacifica Hybrid and Fiat 500e, a car thought to lose the brand many thousands of dollars for each one sold”. Looks like FCA really has things figured out! Not only are they handing money to the US gov and EU via penalties, they’re hand cash over to Tesla for emissions credits. Their future EV competitor gets funding while FCA continues to kill off sedans and put 700 HP V8’s in Durangos. Brilliant. And the Cruze that GM is dropping is not a fuel efficient car? And a cancelled $800 million investment in Detroit Hamtramck right in the shadow of GM’s headquarters. Nothing like supporting the home team eh GM? Don’t waste your time. Tigger isn’t interested in facts. He just closes his eyes, covers his ears, and repeats “GM is bad, Toyota and Ford are good” over and over again. Toyota wasn’t just threatening the Camry plant for any old reason. There was a lot of pressure to unionize the Kentucky Camry plant. Management was just letting the workers know that it costs more to build a Camry in Kentucky than it does to build it in Tsutsumi and ship it over to the US. Which goes to your point of the issues that the UAW creates for the big 3. There’s a reason why Toyota, Honda, VW, and others have aggressively fought off unionization. They’ve threatened to leave the US if their plants unionize. If that is all he makes then he needs to look around as he is underpaid for the market rate. Might not much of his income is deferred in stocks that pay out later. As for Toyota they got a do over funded by the US government a while back after they stopped making weapons that were used against us. They never had the legacy issues that started back in the 20’s or the decades of miss management that we are still trying to clear up today with too many models, too many employees and over capacity in plants that are difficult to close due to poor contracts made by past leaders. On the other hand Toyota can build new plants in the south and avoid unions and save money. While if GM would do this the unions would go on strike else where. GM stock is stable and showing some growth in a contracting market. That is not easy to do. All this while hedge fund people hold the treat of breaking up GM if they do not deliver profits. Recovery from where GM was with the issues they faced were tall and the odds were long but they are slowly moving in the right direction. We are in an era where more companies will fail and pull out of markets. Others will merge to survive. For now GM is in a good position to show value and strength to work with others yet remain independent. Toyota’s wages in the south are comparable with the wages the Big Three pays in the Midwest. The Wages are just a little lower since the cost of living is cheaper, no threat of strikes and it does not take 5 people to hook up the electric to a machine or plug a phone in. The cost of doing business at a non union plant is cheaper. You do have issues in the fall with attendance on the day deer season starts. Also people will change jobs often as there is a lot of opportunity with the growing businesses in the south escaping the North and California. The key difference is that it would take twice as many workers to do the same job as one worker does at a Toyota plant. Hmmm! Toyota profits go to Japan. FCA profits go to the Neatherlands and them London to avoid taxes then to the Agnelli family in Italy or Monte Carlo to avoid taxes. GM the profits 5hey reap come home to Delaware then to Detroit. So while the others give bread crumbs here and the billions in profits go overseas GM brings the money back here. True, the profits come back to Detroit, but unfortunately GM used those profits to invest in plants in Mexico, Brazil and China and buy back stock to artificially prop up the stock price to appease Wall Street. GM spent several billion dollars in the US in the last few years. Where are these investments by Ford and FCA? Why does Ford build their diesel engines in Mexico? Even GM builds their 6.6 Duramax in the US. Ram? First they brag that they’re bringing Ram back out of Mexico, then they flip-flop and double down on their Mexico truck plant. And Ford and FCA spent more and they are not closing plants. Prove that they spent more. I think he just downvoted you instead of proving his claims lol. Indeed, GM has invested in Mexico. They also invested in their US plants…. That doesn’t include the hundreds of millions they’ve invested in US plants since then. GM has more plants in the US than Toyota, Honda, Nissan, and Subaru, combined. Even after Lordstown and Hamtramck closed, GM still has more plants in the US than any other manufacturer. So who’s building new plants in Mexico? How many are directly employed by GM? What percentage of US workers are employed by who? Even after GM closes Hamtramck and Lordstown, they’ll still employ more than any other manufacturer and have more plants in the US than any other manufacturer. Those closings make GM healthier financially and were the kind of actions that needed to happen in the early 2000’s leading up to the bankruptcy. Running plants at 30% capacity is very inefficient and unsustainable. It’s unfortunate for Lordstown that small sedans are a dying market. Don’t forget all the non-assembly GM plants in the US. They have over a dozen transmission, engine, metalworking, component holding facilities, and tooling facilities in the United States. 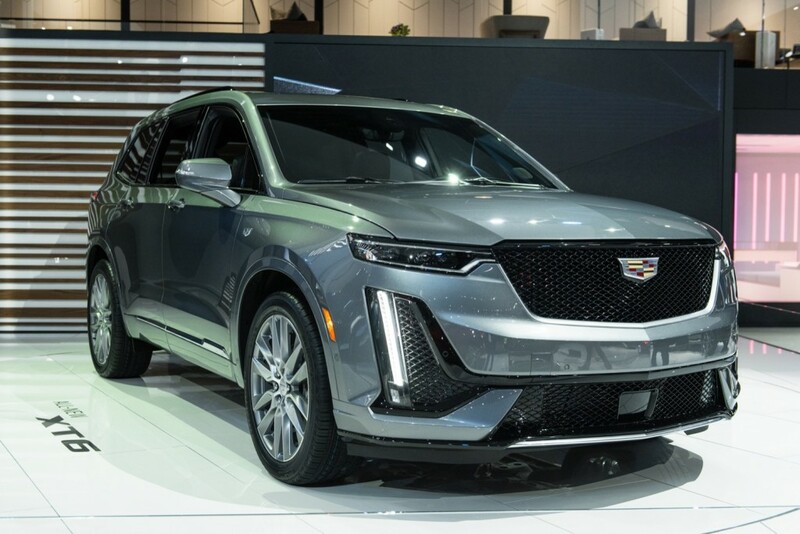 The reasons GM’s plants are running at 30 percent capacity us because you have an idiot named Mary Barra who cannot read market trends and failed to convert the sedan plants to SUVs, trucks and CUVs like Ford, Fca and Honda has. You may want to check your figures. Ford now has more hourly employees than GM and FCA us not far behind. It would not surprise me to see Ford overtake GM in sales as well. Regarding the $22 billion (which is probably inflated per GM’s pr machine, $1 billion was spent at Detroit Hamtramck. A new paint shop was to have been built there but Barra’s new CFO cancelled it all in an effort to appease Wall Street. That’s what happens when the UAW bleeds a company dry. They aren’t the only ones at fault but they get a big share of the blame. Looks like they did a lot of good for all their “brothers” in D-ham and Lordstown. So GM should follow Ford and FCA down the road of only making trucks and SUV’s? Great idea. Next time a hurricane takes out a couple refineries and gas prices hit $5/gallon again, they can all go out of business. Funny that you praise Ford when they’re the ones slowly circling the drains. Cash flow is shrinking, profits are shrinking, Ford’s stock has lost half its value in the last 5 years. They sold nearly a million F-series and they still barely posted a profit. LOL so he posts information showing that they invested $22 billion in the US. You blow it off as fake news. So in other words, you were totally refuted to you just ignore it and move on. THEN he posts a list of all the new plants built in Mexico in the last several years and GM isn’t one of them. Hey look, even TOYOTA is on that list. I guess you didn’t hear the news that production output at Toyota’s San Antonio plant was down in 2018 and projected to down more this year. Just as Toyota completed a major expansion at their Baja de California plant last year and their 2nd truck plant in Mexico is about to be finished this fall. But go ahead and praise them for spending $1.6B in the deep south while ignoring the $20B+ GM invested here lately.